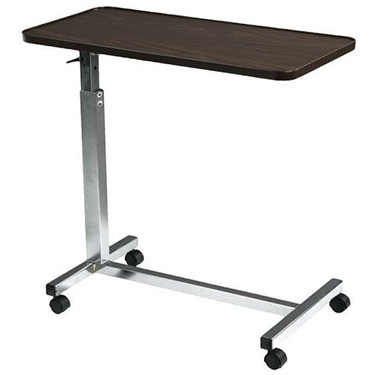 The walnut, wood grain low-pressure laminate top on this deluxe tilt-top table by Drive Medical tilts 33 degrees in either direction, giving you the ability to adjust it to suit your needs. With the slightest upward pressure, the table can be raised or lowered in infinite settings between 30.5 in.-46.25 in., and the top locks securely when the height adjustment handle is released. Chrome-plated steel H base provides added stability and security and lead to swivel casters, which allow for maneuverability. The product is protected with a limited lifetime warranty. Overall; Width at Base: 26.5"
Overall Depth at Base: 15.5"
I read other's comments before purchasing -especially the low ones and they said it was difficult to assemble and that the directions were poor. SO, I was extremely careful to fully understand all the instructions including the drawings BEFORE I began assembly and during assembly. I had to stop and review over and over before proceeding with each step BUT it went together perfectly using only a screwdriver and a pair of slip joint pliers (a correct sized open end or box wrench would have been better but it worked well anyway). Pros:EXCELLENT product for eating in bed, reading or anything including that it tilts with a lip to hold a book etc... in the table. I also liked the challenge that required such close attention to assemble. Made this octogenarian (in my 80s) feel, "I've still got it". The instructions are in very small print - drawings unclear - have not been successful in getting it to a useable state. I talked with a sales person prior to ordering emphasizing ease of installation was critical for me. Excellent for laptop while in bed.